Pic of the day: There are still some left. That's not counting those that are actually in the shelves, or the thousands of comic books and magazines. Or the Hindu books in the back room. Or the Christian books in the bedroom. Naturally I got fed up with my NaNoWriMo novel. It's not like a fad lasts more than 2-3 weeks with me anyway. NaNoWriMo has overstayed its welcome and I don't want anything to do with it. I'm a week behind on my journal. I have books to read. Down with NaNoWriMo! Yesterday I bought a 80-CD rack. Actually it is not intended for my CDs, although I guess I should get one more for all those CDs that now lie in dusty plastic bags. But I already have a rack for most of those I actually listen to. Most of the ones in the bags are not interesting. If there was a used record shop like the used book shop, they would go there. But the original plan for the new rack is for the DVDs. They are the same size as CDs after all. I don't think I have 80 of them yet, but it is getting closer. My curent plan is to take the rack to my new apartment and put it together there, then carry the DVDs over there and put them in place, sorted alphabetically. But then the road froze over. It is hard to carry any large object along the roads as they are now. Each workday I have brought a plastic bag filled with used books to the store in the city. I am finally starting to see that the massive wall of books is thinning in places. It is almost unbelievable how many books I have, and yet it is very little by the standards of my family. Then again, no one else in my family (at least my generation) lives in a small apartment and moves to another small apartment. So they don't have to fight their genetic disposition to hoard books. I will keep some, that have made a particular impression on me, and get rid of those that didn't. Among those I will keep are Brian Aldiss' Helliconia trilogy, about a planet that circles a dim sun that circles a bright sun in a slightly elliptical orbit, so that over hundreds of years it goes through seasons where the climate changes from ice age to searing heat and back. The way this influences human culture is described very well, and made a huge impression on me. It is also filled with ingenious alien life forms. 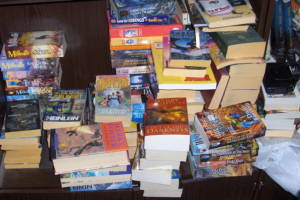 Other books I want to keep are the two Chronicles of Thomas Covenant the Unbeliever trilogies by Stephen Donaldson, and a couple Uplift books by David Brin. From Heinlein, Stranger in a Strange Land - the one really deep book I know of from him - and To Sail beyond the Sunset, the book that introduced me to his imaginary worlds. But everything by Asimov goes. Science Fiction has a short lifespan, since scientific truths fade pretty quickly. Everything by Eddings goes too, because he is basically writing the same book over and over and I'm fed up and overfed with it. I never finished the last one I bought, perhaps 10 years ago. I also stopped Pratchett at Lords and Ladies, though I did buy Science of Discworld, which I kinda regret. I would have kept his book about the boy who became Death's apprentice, if I could pick it out from the stack. It was kinda interesting. Ironically I'm probably keeping most of my books by Piers Anthony. Not because he writes better than Pratchett; the opposite is probably true. But I have a natural talent for writing his type of book, only without the naked children. If I ever go on to finish and publish anything, it will likely be compared to Anthony by every critic that even opens it, or perhaps without even opening it. Right now, however, that's one of the last things on my mind. Did I mention that I've bought a scanner? I intend to scan the hundreds of pages of manuscripts from my younger years, then burn them. Paper takes too much space. If all the books in my bookshelf had been e-books, I could probably have moved them all on a single DVD. Do you wonder why I hesitate to buy paper books anymore? Not to mention write them. If I had written on paper all the fiction I have made since I stopped doing that, it might easily been a small carload. Thousands of pages. I can't keep renting 75% of my space for my paper and 25% for myself. The age of paper is over. At least my age of paper is. Two years ago: Is spiritual good?